When I came across a few tutorials on Pinterest showing how to make a wreath from a pool noodle, my cheapskate self was thrilled. I already had one in my storage space and purchased another one from the local department store for just a few bucks. Having been a frugal crafter for a very long time now, I wondered how I could have even more bang for my buck. 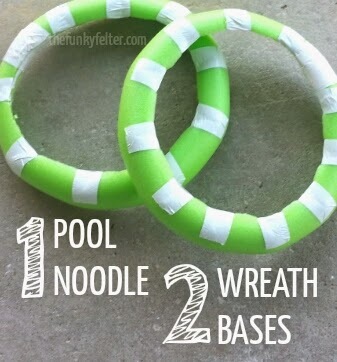 Hence, creating two wreaths out of one pool noodle! Be forewarned, it does take a little time and effort, but it is certainly not rocket science. I estimate the total materials cost for me to make both wreaths was about $7 or $3.50 per wreath. This covered the pool noodle and duct tape (which I didn't use an entire roll, but counted it as such). I already had a large serrated knife in my kitchen so I didn't count that cost. I tried using hot glue on the pool noodle at first and it was a disaster (see below). The very hot glue melts the pool noodle and makes the most awful smell - think burnt cabbage. After burning the pool noodle, myself a few times and making my house smell, well, horrible, I put away my trusty hot glue gun and got out the duct tape. Save yourself and just reach for the duct tape first! 1. 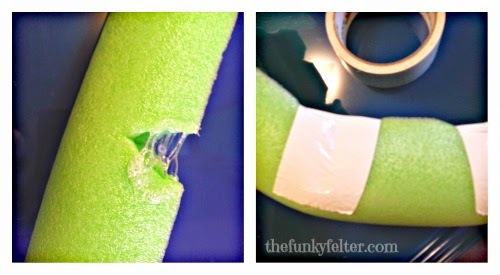 Use a serrated knife to cut the pool noodle in half down the center. It is okay if it is a little thicker or thinner in some places. You won't be able to tell once you cover it with ribbon or burlap. 2. Then cut small triangular notches along the edge of one side on each halved piece. Space these notches every 5 to 6 inches apart down the length of the halved pool noodle. The notches will help relieve tension and allow you to make a curved shape better. 3. Now bend each notched triangle in on itself using the duct tape to secure it in place. Work your way down the length of the pool noodle taping the notches. Be sure to use a liberal amount of tape as those notches have a tendency to pull back apart. Finally secure the ends together with several wraps of duct tape. As a side note, you could also use floral pins to help secure the notches together prior to duct taping them. This will ensure the wreath is very stable. I just used a lot of duct tape around mine and had no problems when finished. I also wrapped my pool noodle wreaths in burlap using floral pins to secure it in place which I think helped with stability. These wreaths will have a hollow or flat back that curves inward slightly. It doesn't show once covered though. Also, my wreaths turned out to be a little more oval than circular. Although I haven't yet tried it, I think cutting less notches farther apart might make the wreath curve more circular. If you try it, please let me know how your wreaths turn out. Later this week, I'll be sharing one of the finished Fall wreaths I made from a pool noodle. Please check back or subscribe to see the results. I am knee deep in Fall decorating right now!